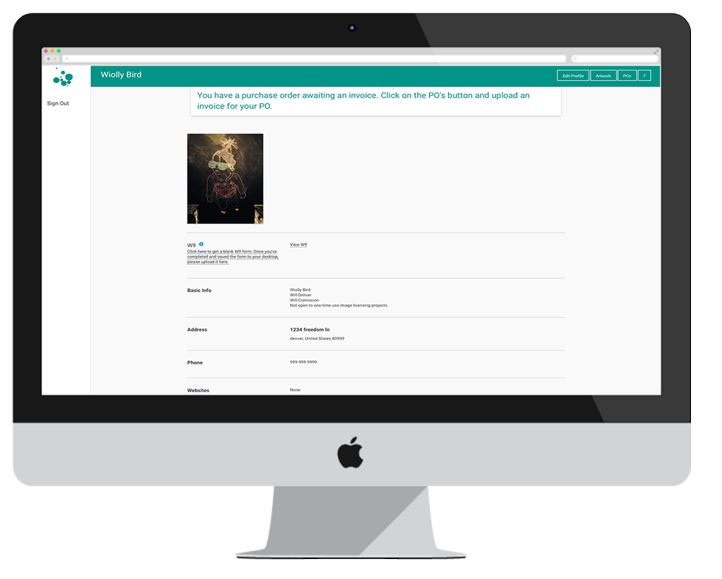 dotfolio® is an online tool to get your artwork in front of corporate buyers. By allowing NINE dot ARTS® advisors access to view your portfolio to sell your work, you get more time in the studio. Galleries are great for residential customers, but what about the rest? dotfolio© gives artists unprecedented exposure to corporate clients around the country. No matter the price, size or creative medium, we’d love to see it. We don’t ask you to fit inside a “box”, we love creativity at its core. All you need to do is add your portfolio and you’re good to go. Let us do all the heavy lifting from there. Unlike an artist’s personal website which anyone can view, dotfolio© is exclusive to corporate art consultants and streamlines the art buying process. Corporate buyers typically buy multiple art pieces from multiple artists on any given project. Start by clicking the sign up link to create your FREE dotfolio® profile. Upload up to 10 pieces of artwork for approval. Get back to being an artist, we’ll take care of the rest. Ready to sell more art with less hassle? NINE dot ARTS© has sold my work for over five years. I have observed over the years that they aren’t interested in merely hanging art on the wall, getting paid and leaving the job site. Rather, they have a deeply considered vision that is carried out throughout a project and they search out art and artists which speak to their creative goals. This creative process of theirs has forced me to push my art further than I would have on my own or with the other art consultants I work with. NINE dot ARTS© put me in a higher tax bracket this year. And that’s a really good thing for an artist. I do business with art representatives internationally and have been so impressed by NINE dot ARTS© since the beginning. They have energy, integrity, and a very keen eye. They have a high level of professionalism and a very forward – thinking vision for the business. We are a Colorado-based company that specializes in curating art collections for corporate and private clients from around the world. Not just a core value of our company, but a fundamental way in which we do business. We pride ourself on keeping artists updated on our decision process every step of the way. Even as early as the brainstorming phase, you’ll know if your art is on the radar. We buy art from artists all over the country to serve our clients from around the world. We sincerely believe in the profound power of art and using our platform to increase the reach and exposure of local artists to new heights. Since it’s founding in 2009, NINE dot ARTS© has established itself as one of the premier art curation firms in the country, serving a wide range of industries. Rest assured that your creative works are being handled by some of the most knowledgable and passionate individuals in the art space.